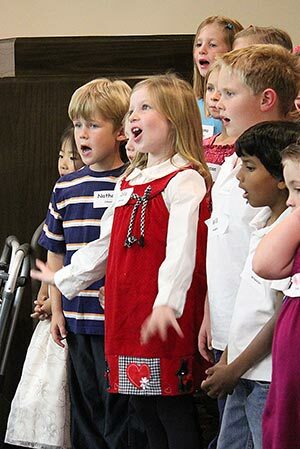 Cadenza is the perfect choir experience for children in grades 1, 2, and 3. Through our welcoming atmosphere, even the most hesitant singer is encouraged to enjoy the fun of making music with his/her very own, inborn instrument, the voice. Carolyn Welch , Katherine Stoltenberg and Joyce Jordan work to provide Cadenza with a wide variety of opportunities to explore the wonders of singing by introducing folk songs, spirituals, game songs, ethnic music, tongue twisters, and beautiful melodies. Games that teach musical concepts lay the groundwork for music reading. Tuition is $140 per session. Tuition scholarships are available.